I begin with gratitude to Andrea Davies, a new and younger friend, for her Facebook post of Robert Waldinger’s Ted talk on “Lessons from the Longest Study on Happiness.” The study of octogenarian men over their lifetime concludes that relationships— those we can rely upon for support and connection over time—can help buffer life’s inevitable personal and physical challenges. As a female octogenarian, I can attest to the wisdom of friendship and its effects on well-being. When I turned fifty, after twenty-five years of maintaining a psychotherapy practice and my children near grown, I asked myself, “What can I do now that I’ve done it all?” The question was both naïve and sincere and pointed to my state of mind. I felt lost, that something was missing. In truth, I had dedicated time to my husband, my children, my parents and clients but took little time to develop intimate relationships with friends. 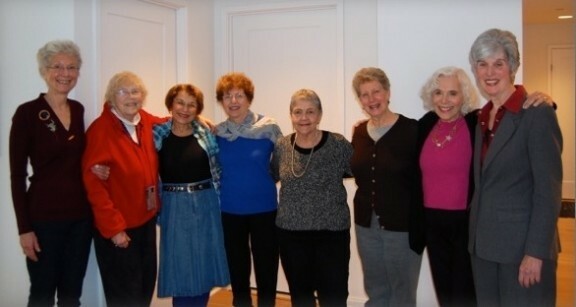 Six years later, a neighbor and walking friend, Bev Bader, invited me to join a women’s group. Nine of us spanning thirteen years in age, all married with children and careers, convened. I was the oldest by six years. The commonality of approaching middle age with present or impending transitions bonded us. Over the course of twenty-seven years, eight of us have continued to meet monthly with two months off during summer. We meet for two and a half hours, in a circle, and divide the time equally for each attendee to tell her story. I recall my nervousness those start-up years when my turn came to state aloud what I wanted and needed in my personal life. As a therapist, I was a listener with responsibility to guide, to help. As a group member, I was vulnerable, sharing aspirations and struggles for which I often had no answers and needed feedback. I learned, over time, that others could help with perspective and offer support. Bev, Rosemary, Janet, Claudine, Carol, Joan and Eva have walked beside me through the launch of my adolescent children, their choice of spouses, the birth of five grandchildren, my husband’s heart episode, the decision to retire and close my therapy practice, my longing and quest to become a writer, my return to school for an MFA in creative writing. At age seventy-five, I graduated from Pine Manor’s Solstice MFA program in creative writing. As I looked out at the familiar faces of family and friends, I was aware that the fulfillment of my long journey to become a writer was, in great part, due to the unswerving support and encouragement of my husband and friends. I am grateful for the nurturance and sustaining friendship of my woman’s group. What we give and what we take are found in the telling of our stories, the trust that comes from the circle. We are, in truth, lifelong sisters. This entry was posted in Happiness, Mindfulness, Relationship(s), Uncategorized, Well-Being and tagged abiding relationships, healthy aging, sisterhood on January 4, 2016 by fayewriter. I loved reading about your experience being in our group. It is beautifully written and touching for me to take it in. I’ve loved traveling with you on your journey and look forward to staying on it with you for the years to come. You are a joy and comfort to have as my friend. Carol, thank you for your special and kind words.I’ve also loved traveling with you on your journey and look forward to walking (sometimes, running) the hills and vales, the unexpected offshoot paths, for years to come. See you soon, my friend. Reaching in and out— very fluid. I like it! Faye, This is lovely and has been so appreciated by my women groups of friends, both from college ( 45 years! How did that happen?) and from an exercise class at the Y, 28 years ago. Jill, 2 groups, how smart of you. Thanks for forwarding my post along. I like the openness of the semi-circle shown in our group photo, and the “circling” that your words decribe about our story-telling over the years. How well you pinpoint the effort it takes–and the joys!